The big thing now is: Fake News. On the political front, this is a huge problem, as our major media has capitulated almost entirely to the liberal side, and only broadcasts and prints stories that advance their own particular left wing agenda. Facts be damned! Fortunately, now we have the internet, and we can actually fact check what is being broadcast to us. We also have Fox news, which really is “Fair and Balanced”, as they advertise, and talk radio to tell us the other side, the real news. Fake Medical and Health news is just as real of a phenomenon, and keeps most of us totally in the dark as it concerns our health and well-being! As a paleo practitioner, you are probably becoming aware of this, if you don’t know it already. Ironically, the vast majority of traditional medical doctors dismiss the paleo lifestyle and diet completely; and do so without reading the recent research on the subject, the clinical trials, or anything else- just like those who follow the New York Times follow its dictates blindly, like lemmings, so too do most medical doctors, nurses, and everyone else follow 40 year old medical science just as blindly. Most heart procedures are not only incredibly expensive and dangerous, but they don’t really work as advertised. Only in a life threatening situation, where the patient has already had a heart attack are they helpful at all! As a preventive measure, for instance when the doctor’s “tests” lead him to pronounce that ‘Your arteries are 95% blocked,’ or some such statement, and then he says you need a stent to prop your arteries open. Well, that’s not how it works. If you go through with this incredibly dangerous procedure, and it you live through it, the benefits are very temporary. Your arteries will fill right back up, narrowing again. It’s kind of like bailing out a leaking boat, without first fixing the leak that the water is pouring in! You need to fix your lifestyle and diet- go paleo, in other words, and heal your body from the inside out- the body heals itself, not the physician. This goes for the drugs everyone is being sold- the statin drugs are toxic drugs with all kinds of side effects, and they are pushed to sell in the many billions of dollars. They are supposed to help control cholesterol, when it has been overwhelmingly shown that high cholesterol is not a problem for the vast majority. The drug sales just make the pharmaceutical companies, and the medical clinics, lots and lots of money! Even in small ways, you can avoid toxic drugs like aspirin and Tylenos, ibuprofen and all the other NSAID drugs that perforate your gut lining (just as does wheat! ), and make you susceptible to all of the autoimmune diseases that are destroying our whole population. Take white willow bark if you need to treat pain; not only is it very effective, it is actually good for you- artificial aspirin is actually quite harmful, since it is an isolation of the acetylsalicylic acid that is one component of the white willow bark. If you take the whole product, instead of the chemically produced version, it is far gentler on your stomach and intestines, and actually a real food type of product. The main takeaway is to not take any drugs. Really- legal or illegal- they all have really bad side effects. ALL. And clean up your diet, getting rid of the grains and sugars, and the processed foods. Eat real, God-made foods, like pastured meats, dairy and eggs. LOTS of green veggies- a green smoothie is very helpful in this regard. Exercise daily, including lots of stretching, and do not run long distances or lift heavy weights- both will wear out your joints. Do bodyweight, and especially the Perfectly Paleo Exercise of virtual resistance exercise! Walk barefoot, and rebound daily as part of your morning routine. Sleep 8-9 hours per night. Use intermittent fasting on a regular basis, practice not eating skipping supper, or breakfast, or both. That’s it, really- just by doing those very simple, and actually liberating things, you will rebuild your health, and free yourself from dependency on drugs, clinics and doctors. Think about it: things are often made needlessly complex so that we rely upon others, rather than on ourselves- and if we do that, those very people benefit by taking our money! Forget Fake News, and especially Fake Medical News! 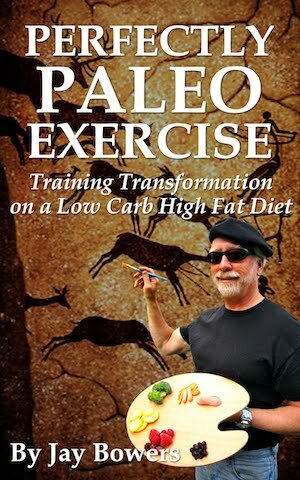 Go paleo, be an ancestral human who thinks for him or herself! You will be healthy, and happy and mentally well-adjusted- not a liberal sheep that does what he is told, by those who benefit by having him as a “useful idiot”, as these types were referred to by Communist leaders.